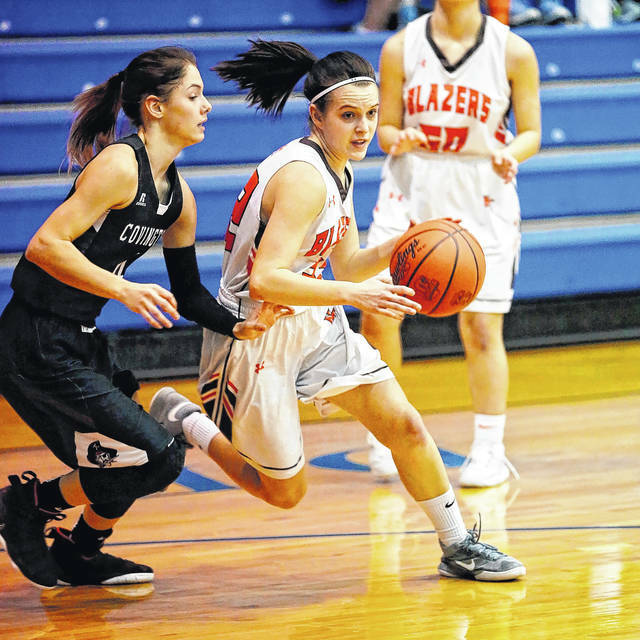 National Trail’s Savanna Abner attempts to drive to the basket during the Blazers first round sectional tournament game on Saturday, Feb. 17, against Covington. Trail had its season come to an end with a 57-40 loss. The Blazers finished 5-17. 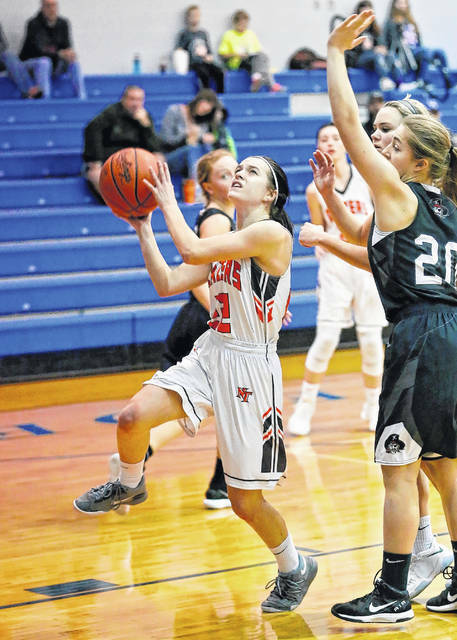 BROOKVILLE — National Trail’s girls’ varsity basketball team got off to a good start in its opening round game of the Division IV sectional tournament against Covington. 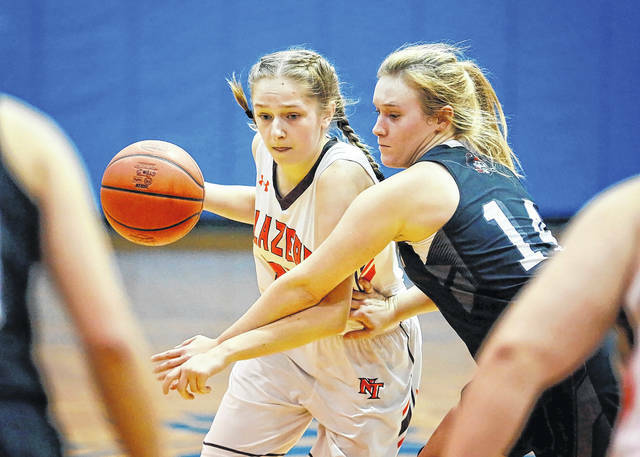 The Lady Blazers, however, allowed Covington to take control of the game to start the second quarter and could not get back in it. 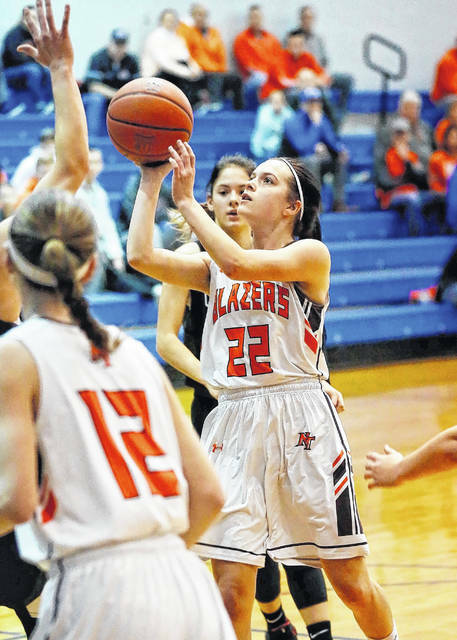 The Blazers opened the tournament on Saturday, Feb. 17, at Brookville High School and dropped the game by a final score of 57-40. The Lady Blazers played well in the first quarter which ended tied, 9-9. NT moved the ball well offensively and was able to get good shots — but failed to connect on several opportunities. Covington struggled offensively in the first period, but got things going to open the second. The Buccs opened with a 3-pointer to take the lead and start a 17-1 run to take a 26-10 lead. The Lady Blazers scored five points in the final minutes of the quarter to pull within 14, 31-17. The two teams played even through much of the third quarter. NT was able to get to within 12 at one point, but could not get any closer. Covington extended lead in the fourth period and led by 20 at one point. Evan Byrd led National Trail with 12 points, followed by Savanna Abner with 10. Makena Laird added seven. Trail ends the season 5-17, losing its final 12 games of the season. Covington was scheduled to move on to play Twin Valley South on Tuesday, Feb. 20.